Written on November 3, 2005, and categorized as Secret and Invisible. Here we are, sitting comfortably in month eleven of a twelve month long year of writing. These months are funky months, which means they are liable to change at any time. Funky months can be any length, they can space out, push forward or sit back in the pocket. They have, as M pointed out, nothing to to with the sun or the moon, although they coincide in general with the conventional months of the year. Some of the months have been re-named during the process of writing – notably Mrs Whitfield – and so to begin this month, the penultimate month of 2005 (or 14035 in dog years) I have named it Gibson. Gibson is frosts telling you autumn is deepening and winter approaching. It is the change of season when viruses celebrate their annual mutation. It is the panic time before all light is sucked down the rasping drain of midwinter, now less than 50 days hence. It is a time when you can say “hence”, “whence” and “thither” without a trace of cynicism. It is the time when you most crave warm beaches and tropical fruit, and yet are least likely to get them. Gibson is also the time when I feel most introspective and least like expounding anything. When I was younger I would fill exercise books with wistful poetry, compose sonnets in my head as I struggled up Grange Hill in the wind and rain carrying three school bags and a trombone. Now I am organising studio sessions and writing songs with a young singer. 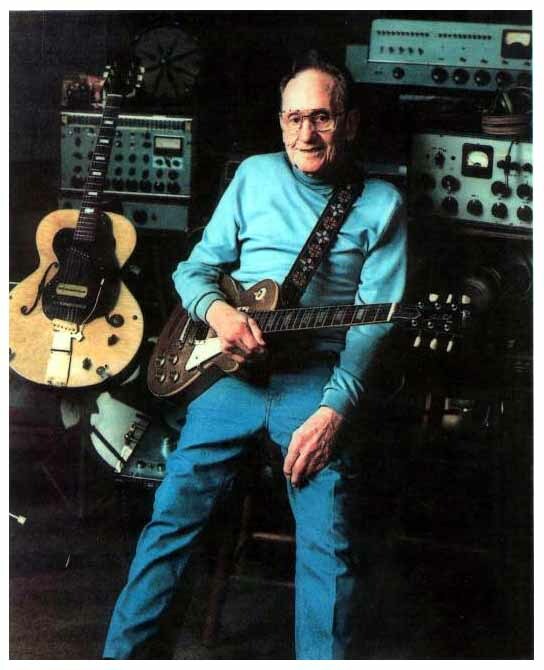 Before I commit myself to the month-long Gibson theme, I want you to closely study this picture of Les Paul, the designer of the famous guitar, and tell me what you see. a fine name to dedicate.